Try our version of the classic Scottish dessert, made with strawberries, caramelised oatmeal and yogurt. Place the strawberries in a large bowl and gently stir in the liqueur and caster sugar. Leave for 10 minutes or so to allow the fruit to soften and absorb the flavour of the liqueur. Meanwhile, place the oatmeal and brown sugar in a small heavy-based saucepan over a gentle heat and cook for 2-3 minutes, stirring continuously until the sugar has dissolved and the oatmeal is golden and caramelised. Remove from the heat. Spread the oatmeal out on a plate to cool, breaking up any large clusters with a fork. Just before you are ready to serve, fold the caramelised oatmeal gently into the yogurt. Assemble the dessert by spooning a layer of the strawberries and liqueur into the base of 4 small glasses. Top with a layer of the yogurt mixture. Repeat the layers, spooning any remaining liqueur over the top. 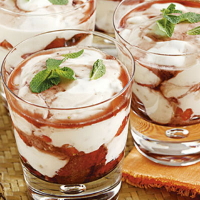 Decorate each one with a sprig of mint and serve immediately. Use other summer berries such as raspberries or blueberries, or make the dessert with desiccated coconut instead of oatmeal. Caramelise the oatmeal in advance, cool and then store in an airtight container for up to 1 week.